Strong but Soft Material-3 composite layers,Top layer is made of soft fleece and ample sponge padding.The picnic rug backing covered with PVC film effectively insulates the heat, tear-resistant and tough,keep dry for a long time even in the wet ground. 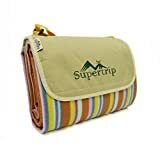 Waterproof Moistureproof and Sandproof Backing-Waterproof backing layer to prevent any wetness from the floor getting on your clothing which perfect for all outdoor activities from spring to autumn, especially for beach camping, comfortable to sit on or lay down when go for a picnic. Foldable and Lightweight to Carry-Nice big and very soft and enough for 4 people,Extra large size unfolded measures: 57.1 x 76.8 inches&lightweight 1.9 pounds, folded measures:11.8 x 9 x 3.9 inches, Thickness:10cm/3.9,it’s large enough for the whole family to sit on, or for at least two members to stretch out and lie down on it.And it’s easy enough to fold up into the right shape for carrying which makes for a less frustrating end to a picnic. Adjustable in Size Handle/Strap-You can also adjust the length of the carrying handle to turn it into a shoulder strap.It’s generous enough to be carried over the shoulder.The carrying strap is a marvellous inclusion. It means you can get someone else to carry it rather than it going in the bag with the food etc. Extensive Use-Ideal family size for all outdoor and indoor activities such as picnics, camping, seaside. It is also suitable for BBQs, festivals & sporting events. Also makes a perfect baby crawling mat or child play mat and temporary break bed. Supertrip Extra Large Portable Foldable Picnic Blanket Mat is featured with soft fleece top and waterproof backing on the underside.Unlike many other picnic mats this is sturdy,soft and comfortable and should last a long time.This beautifully mellow coloured picnic blanket folds up into a smart, lightweight bundle, complete with carrying handle, allowing even the children to help carry things to the picnic spot.The back is very slightly padded providing a bit of protection from sticks and stones on the ground. The back is also waterproof,moistureproof and sandproof.This picnic rug is suitable for all outdoor or indoor use. Perfect shoulder straps and can adjust it optionally. Popular and classical stripe design,Waterproof,moistureproof and Sandproof. 3 composite layers material: Fleece + Sponge + PVC film, comfortable and thick enough,Good characteristics for wear resistance. Can not be machine washed, but can be dry cleaned, or iron, naturally air dried will be great.